Mang Inasal is a fastfood chain that was established since December 12, 2003. It is one of the affordable fastfood chains in the country that offers chicken bbq +unlimited rice and soup. So if you have big appetite and doesn’t want to pay for extra rice, Mang Inasal is the answer. But my son loves fried chicken so we seldom dine here but for a change sa nakakasawang fried chicken, we will eat here. While scrolling my pictures in my phone, I saw food photos when we dined in Mang Inasal last March (twice). Sharing to you the food that we have tried such as Chicken BBQ, Pork, BBQ, Dinuguan, Bangus Sisig and Halo-Halo. What I like in their menu is, they offer regular meal and meal that has unlimited rice. My son and I always order regular meal while my husband go for unlimited rice. 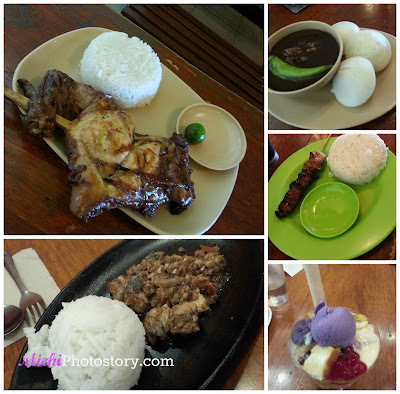 What’s your favorite meal in Mang Inasal? I missed eating at Mang Inasal. My son prefers fried chicken kasi.I want to try Mang Inasal's halo halo pa naman. Chicken inasal is the best! Mang Inasal is a fav food plce of mine too! It's been a long time since we last visited Mang Inasal! I love the halo-halo and ensaladang talong the most! (not mentioning the chicken - it's already given. hehe). So good and mouthwatering! I like their chicken barbecue the best. Yum!